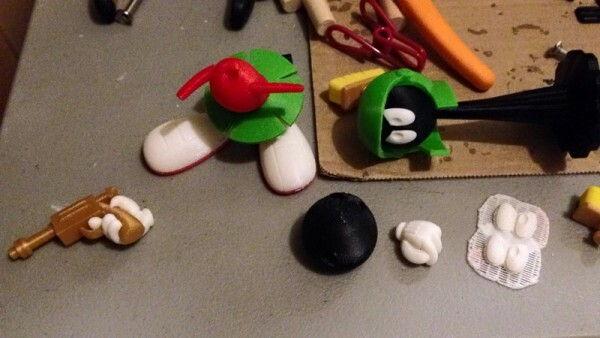 For a long time now I’ve wanted to make a desktop figure of one of my favorite cartoon characters Marvin the Martian. Marvin is made from 28 parts in five colors, Marvin was a project of love. I modeled him in T-Pose so I could pose him how I like. I haven’t yet rigged him (which means to give him a skeleton of joints so he can move realistically). For this first pose I used lattice deformers to bend the arms and legs and stuff. I really dig that laser gun. Have you ever thought about making some of those (or something similar) for Cots? I know some of your designs take a lot of work and prep time, etc. But some cool sci-fi or unique guns for the AT and the evil Adversaries would be pretty sweet too! Might be easier to print up a bigger batch of them and not have so much assembling and such. Just a thought… Or maybe I just want some cool laser blasters haha. I do make some laser guns (ray guns) available on my Shapeways store. Search for FourthD. There’s a bunch of stuff there, and Shapeways is not the best at allowing people to organize their models in a way that makes sense, but you should find several GI Joe sized ray guns and a new sci-fi blaster pistol there now. Unfortunately, Marvin’s pistol isn’t one of those. Marvin’s is intended to be blocky and basic, cartoon-like. My other ones are much nicer. 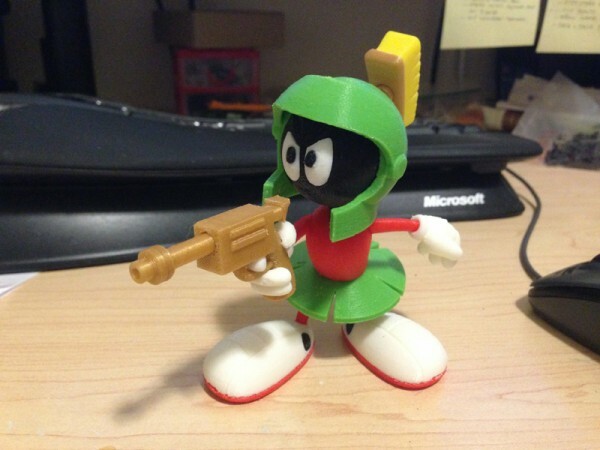 Is the Marvin available for purchase? Sorry, no. The copyright is not mine. This was a project for my own enjoyment.